Graduate student forward Tyler Cavanaugh reacts after Friday night's final whistle. Cavanuagh had a game-high 23 points and 12 rebounds in GW's quarterfinal loss. 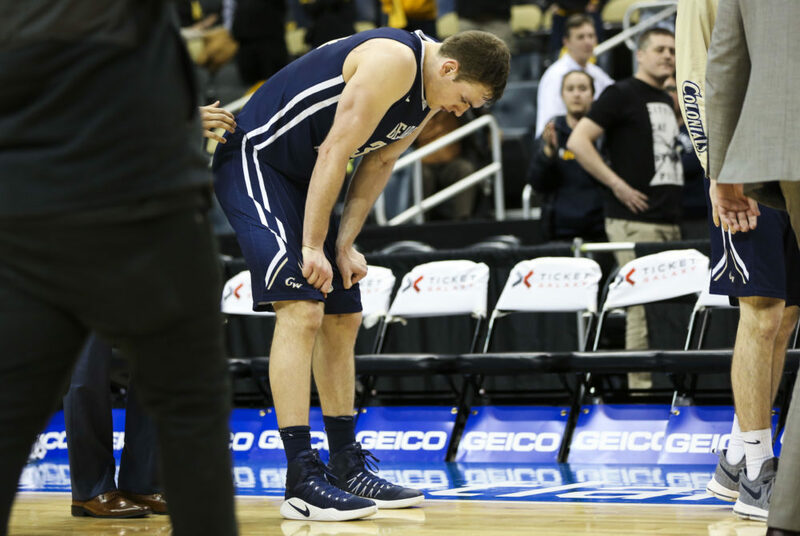 PITTSBURGH –– With 5.8 seconds remaining in the Atlantic 10 Championship quarterfinal, men’s basketball prepared to inbound, down 68-67 with its season on the line. GW had just battled back from a six-point deficit against third-seeded Richmond in the game’s final minutes, displaying a resilience interim head coach Maurice Joseph has touted all season long. A few weeks earlier, the Colonials came back from down 18 at Fordham. They had two buzzer-beating wins over Temple and USF, nearly a third against VCU last month, and closed out the regular season with an upset victory over first-place Dayton. The crunch-time situation at PPG Paints Arena Friday night was not an unfamiliar one – more times than not this year, the outcomes fell in GW’s favor. But not this one. With leading scorer Tyler Cavanaugh double-teamed, junior guard Yuta Watanabe drove to the rim trying to will a game-winning two into the basket or draw a foul. He was stripped by Richmond’s Khwan Fore before he could get there. Fore’s steal and fast-break bucket that followed sealed Richmond’s win, and ended GW’s A-10 Tournament run by a 70-67 decision. Cavanaugh takes a two-point jumper. Cavanaugh provided the Colonials with yet another tenacious performance, finishing with a game-high 23 points and 12 rebounds in what could be the final game of his collegiate career. The outing marked the graduate student forward’s 12th double-double and 15th 20-point game of the season behind a 9-of-12 clip from the field and a team-best 3-for-4 mark from three-point range. Graduate student forward Patrick Steeves was the second Colonial to finish in double-figures with 16 points and five rebounds, followed closely by sophomore guard Jordan Roland who put up a big nine points in the second half off the bench. The team’s impressive 54.9 shooting percentage from the field on the night, however, was not enough to overcome 13 turnovers and a pesky Spiders’ offense that got to the line 12 more times than the Colonials. The third meeting between the two sides this season saw a total of 21 lead changes was back-and-forth from the get-go. The Colonials came out of the gate with much improved shooting compared to Thursday’s first half against the Billikens. GW made up for seven first-half turnovers with a stellar 58 percent clip from the field, and went 4-for-7 from deep – two of which came from redshirt junior guard Jaren Sina (6p). Cavanaugh led the way offensively in the opening frame with 13 points on 5-of-6 shooting, and a half-high five rebounds. Graduate student forward Patrick Steeves goes up for a running jumper over a Richmond defender Friday night. He finished with 16 points and five rebounds. The underdogs struck first with a three-pointer from Sina, but their early 3-0 edge was the largest lead it would see all night. Although, the Spiders were held to just 39.4 percent, they had nine more attempts from the field after winning the boards by one and turning the ball over just once to GW’s seven. 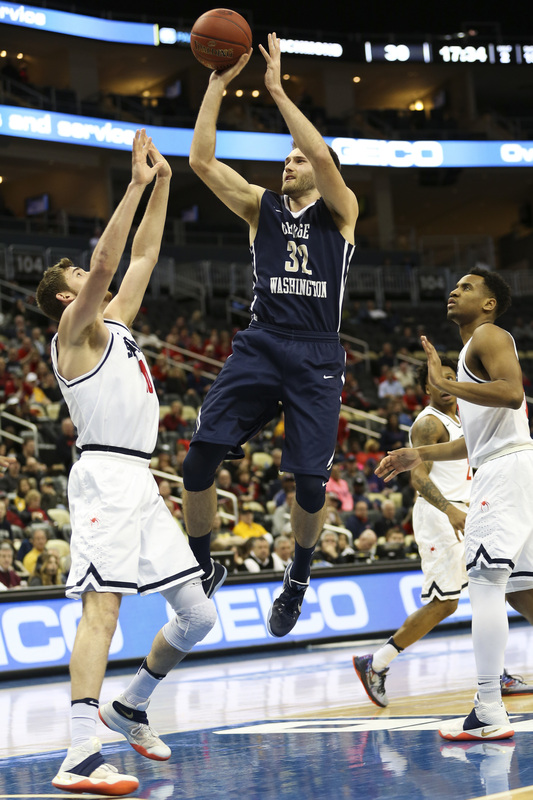 Watanabe was certainly a bright spot in GW’s staunch defensive effort, limiting Cline – the 2017 A-10 Player of the Year – to eight points on the night and a 2-for-8 clip from the field in the first half. At the halftime break, the sides were tied at 34. The Colonials took the first lead of the second half but were quickly put on their heels with a 8-2 Spiders run, sparked by a three-pointer from Jones. For the next six minutes, Richmond maintained a small advantage despite a barrage of baskets from Cavanaugh. With just over eight to play, he finished a layup that gave GW what ended up being its last lead of the game. 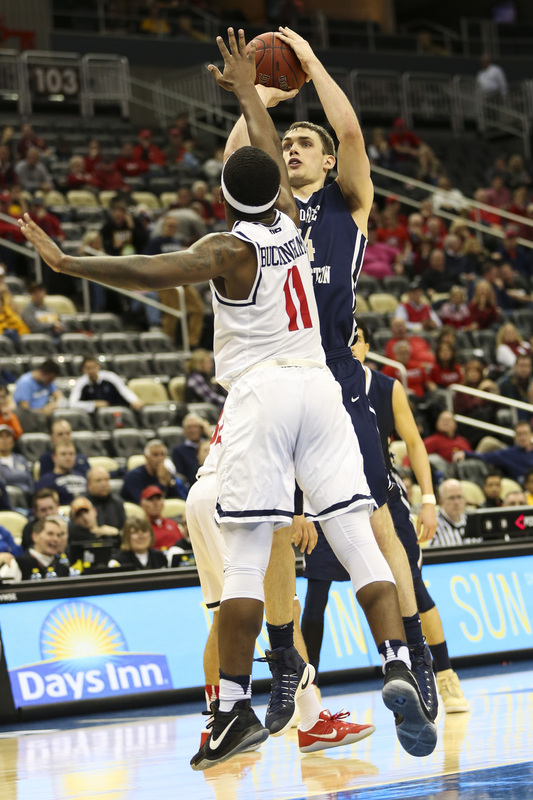 Cline’s only made free throws came in response to a pullup jumper by Roland and gave the Spiders a 66–60 lead, tied for their largest during the contest. During the final three minutes, the Colonials defense stepped up its intensity. They prevented Richmond from scoring on five consecutive possessions as their offense went on a 5-0 run, to put themselves in a position for a final-second game-winner that never materialized. The Colonials end their 2016-2017 campaign at 19-14 and await a potential bid to a second-tier postseason tournament. “My hope is that we have more basketball to play. I think we deserve it,” Joseph said.